See scan - absolutely perfect condition. This is an extremely scarce and considered the rarest of all Bulgarian Royal 1920ies special award decoration. The badge was presented by the State Government Police as a decoration for extreme achievements and PERFECT SERVICE and merit to the Police. 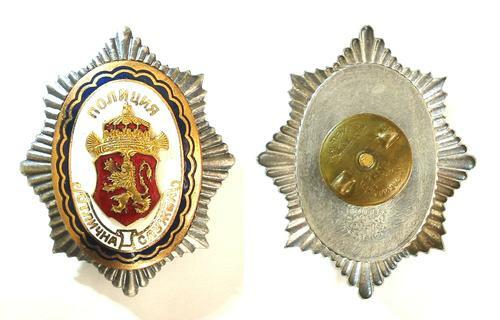 The badge was awarded to a very limited number of Bulgarian Police officers - probably less than 20. The badge has a nice white enamel with the Police red enamel Coat of Arms and lion at center of the silver star, surrounded by the text - POLICE - PERFECT SERVICE and DARK BLUE decorative border around it. The piece is also marked by Bulgarian Master Miloshev both at its reverse base, as well as at its pin knob. This is the rarest type of the Bulgarian Royal Police badges and so far not more than 3 or 4 other pieces are known in private collections. Absolutely scarce militaria / police related collector piece and one of the rarest Bulgarian badges and proficiency insignia.